The fitness SEM group got to enjoy nice weather, play a game, and work on being healthy. Congratulations on taking third in the district! Mrs. Rampy rewards our excellent readers with a trailer full of games for the day! Students use Chromebooks to practice speaking Spanish. The smiling faces of our 3rd Grade! And even a couple of their AWESOME teachers. Elementary is Sewing up learning! Your eyes do not deceive you. Kids are learning to sew in SEM. 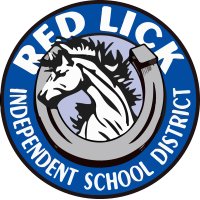 The mission of the Red Lick ISD is to provide student with an enthusiastic learning experience that is exceptional; to embrace the diversity of our students' learning abilities; to inspire optimism in all students so they may realize their full potential; to be proactive in providing teachers with current technology and training; and to be relentless in the pursuit of these principles for the benefit of our students.